A swivel ring flange (SRF) is a two piece constructed flange used extensively for offshore pipelines and offshore industry applications. A swivel ring flange has a heavy forged welding hub that is fixed to a forged ring that can be rotated to serve as a mating flange to a weld neck or another flange. In a swivel ring flange, the rotating ring is held on by the welding hub that is in turn secured by a retaining ring. 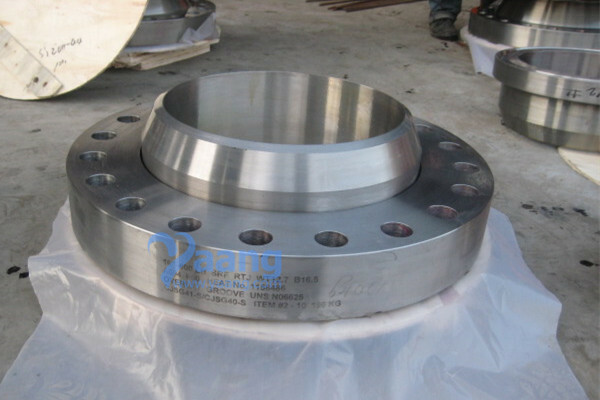 China Swivel Ring Flange Manufacturer Yaang offers ASME B16.5 Alloy 625 Swivel Ring Flange, RTJ, 16 Inch. 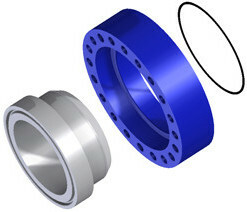 A swivel ring flange is also known as a swivel flange. Swivel ring flanges are favored because they do not cause any problems in the alignment of bolt holes during sub-sea flange installation. Swivel ring flanges are available in various metals and specifications, including class 150 to class 2500 specifications and from 1 inch to 60 inches in diameter. These flanges are readily mated to any standard welded neck flange and are very similar to ASME / ANSI B 16.5 and MSS-SP44 standard flanges. Swivel ring flanges are constructed using a specific grade of carbon steel or stainless steel having ASTM A105 specifications with a minimum yield of 42,000 psi pressure. Some extra thickness is provided at the welding end. These flanges are also manufactured using superior grade materials such as A694 or A707. Stock inventory sizes are available from 2″ to 24″ for immediate delivery. Additional sizes available upon request. One of the main features of a swivel-ring flange is that it allows a 360 degree rotation of an outer ring around a hub and this enables easy alignment of bolt holes when attaching to a standard flange. This is particularly important for subsea applications when there is only one diver available to align and set up the flange connection. At YAANG we can design swivel-ring flanges for a variety of size and pressure ratings; standard specifications being API 6A, ASME B16.5 and MSS SP-44. We can also custom-design swivel-ring flanges based on your specific requirements. Swivel-ring flanges consist of an inner hub that is welded in place and an outer flange ring that is able to rotate freely. This makes swivel-ring flanges easier to install in difficult situations such as subsea applications. Swivel-ring flanges can reduce cost and increase safety in subsea scenarios and thatâ€™s why they are commonly used in the offshore industries. Bespoke to customer drawings / design. Where can we find the high quality ASME B16.5 Alloy 625 Swivel Ring Flange RTJ 16 Inch. Simple design facilitates bolt-hole alignment. Spring retainer eliminates welded retainer components. 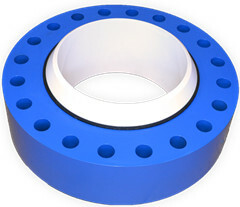 Removable retainer allows for cleaning and lubricating of the hub-to-flange interface. Thicker flange ensures ability to handle higher-stress loads, which some brands fail to meet. Fully compliant with ASME Section VIII.